Work with our highly motivated and talent coaching staff. We will increase player attendance and performance as well as as assisting with all current club challenges. Unique challenges face every soccer club on a daily basis; balancing player development with logistical constraints is a task that can be improved by utilizing the professional services of U.K. Elite Soccer. Our Experience in creating effective club programs simply cannot be matched. U.K. Elite Soccer created the professional trainer model in 1992, today it is utilized by thousands of soccer clubs nationally. 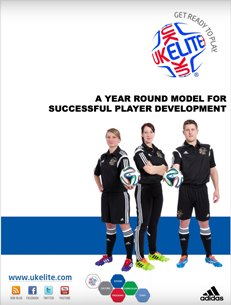 An exclusive group of clubs and teams have been fortunate to work with U.K. Elite Soccer. 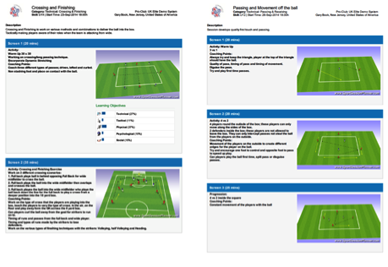 We will apply knowledge consistently to every aspect of your club, the results will be dramatic. The first step will be to initiate a club or team consultation; our goal will be to provide a clear, structured development plan for the club or individual team. For more information, please contact clubservices@ukelite.com or call 973-631-9802 ext 203. Senior U.K. Elite Soccer coaching personalities are available to lead the technical and administrative development of your club. Each member of staff is expertly trained in curriculum development, program design, club operating procedures, organizational structure, evaluation and development of coaches and successful player development. Reporting to your club board each DOC has the option to retain U.K. Elite Soccer coaching staff or expertly assemble a team of club specific coaches. A strong emphasis will be placed on the unique strategic vision of each club. For more information, please contact clubservices@ukelite.com or call 973-631-9802 ext 203. For more information, please contact clubservices@ukelite.com or call 973-631-9802 ext 203. Utilizing professional qualified coaching staff to ensure objectiveness We will employ a unique set of evaluation criteria and a proven tryout system We will help establish teams that fit in with the overall mantra of your club A pre tryout consultation will ensure every aspect is professionally planned and executed. An integral part of creating a successful soccer club We will help provide volunteer coaches and parents with information and confidence to teach children Coaches will become increasingly aware of coaching methods and techniques as well as critical of their own performance Clinics and courses are available, address topics that are currently affecting your club. 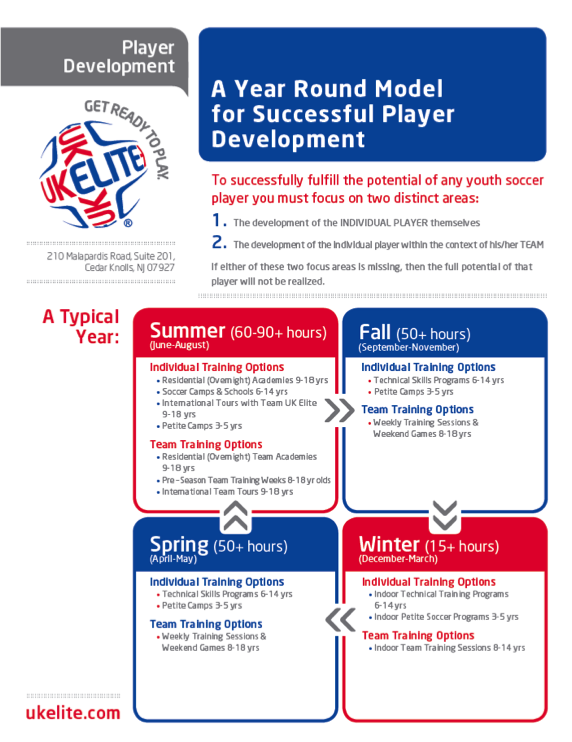 A consistent player pathway implemented throughout club programs via dynamic scheduling to maximize player and coach ratios. A progressive age specific curriculum focusing on parent and coach development is included in all programs. We have several options available for your club. Customize soccer events or execute a specific idea that will help build your club brand and raise valuable funds. Use Funds to offer Free Training, Soccer Camps and Schools of offset operational expenses. For more information, please contact Nancy Walsh or call 973-631-9802 ext 214.